It’s come a long way from the royal stages of 17th century Paris, yet Roger McGough’s adaption of Moliere’s satirical classic is still prompting gleeful giggles. The play’s hero Alceste, played by Colin Tierney, arises from the deceitful gossip and false camaraderie in pursuit of plain, honest truth. The sarcastic drawl and deadpan finality with which he unleashes his blunt prose cuts a sharp contrast to the frivolous verse of his contemporaries, mocking their contrived effort and amplifying it hilariously in the inept attempts of blundering manservant Du Bois. 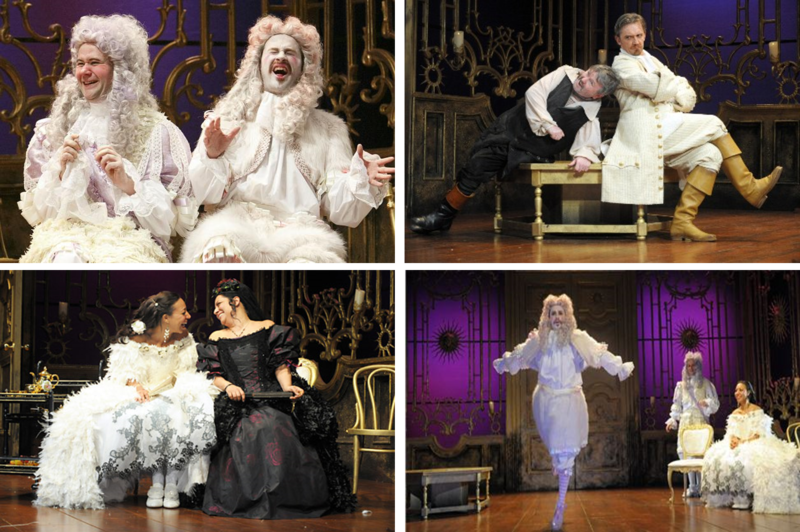 With the characters’ purple-tinted wigs, lavish, drag-inspired makeup, fluff-ball poodles and embellished struts across the stage, it seems that Alceste may be in for a challenge in this existential portrayal of a vain, narcissistic and insincere society that every audience member still finds themselves a part of.